The one burden of being a part of a food-loving family is the inevitable post-feast hangover associated with high days and holidays. This weekend was no exception. The butter, the chocolate, the treats both sweet and savoury - the days flew by in a pastel haze of overabundance. There is stilll a half litre of heavy cream in the fridge. Not ready to deal with that just yet, a respite seems in order. As in the past, and like Molly it seems, I find my comfort in the bottom of a bowl of soup. 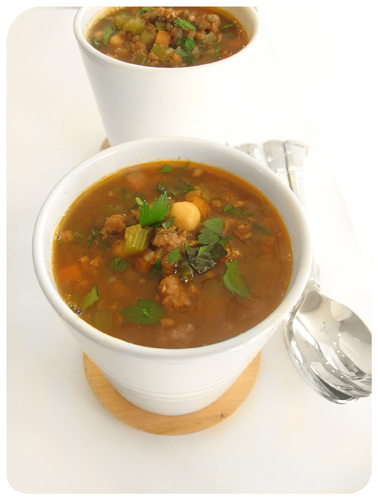 Borrowing heavily from the Mediterranean pantry, this chorizo and lentil soup offers substance without excess, flavour without flamboyance. I could use a nap. My own recipe. 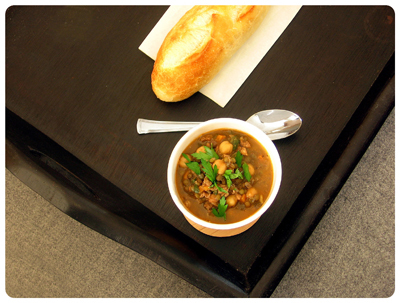 The spiciness of the chorizo lends personality to the subtle lentils. A rustic meal in itself, hearty and satisfying. Goes brilliantly with an old movie, preferably one from the Thin Man series, and a comfy couch. Pick over the lentils and discard any misshapen ones or stones. Rinse and drain the lentils through several courses of water until free of any grit or sand. In a saucepan over high heat, combine the lentils, stock, 3 cups of water, thyme and garlic. Bring to a boil, then reduce the heat to medium-low and simmer uncovered until the lentils are just tender, about 15-20 minutes. You will need to skim the surface occasionally for impurities. Meanwhile, in a stockpot over medium heat, crumble in the chorizo into one tablespoon or so of olive oil. Cook until the sausage begins to render some of its fat. Add the celery, carrot and onion, tossing to coat in the paprika-stained oil. Season well with salt and pepper, and continue to cook, stirring often. When the vegetables are translucent and tender, after about 10 minutes, add the tomato paste and stir through. Cook for 2 minutes or until the tomato paste begins to darken. Remove the garlic and thyme from the lentils. Add the lentils and their cooking liquid to the stockpot. Bring to boil, then reduce heat to low and simmer for 20 minutes. Add the chickpeas, and additional water if necessary, and simmer for another 10 minutes. Check for seasoning. Ladle into bowls and sprinkle over the chopped herbs. Serve with olive oil for drizzling and grated Parmesan and passed alongside. • Omit the chorizo and stock for a vegetarian version; in this case, cut back on the tomato paste and add a medium can of crushed tomatoes for additional body to the broth. • Cannellini beans can be used instead of the garbanzos (chick peas). • Longaniza (or longganisa) is a fresh Chilean variety of chorizo. Cooked or cured sausage varieties can be substituted. • A splash of red wine vinegar to finish will balance the richeness of sausage and creaminess of the lentils. All original content copyright © 2005-2017 and property of tara o'brady + seven spoons, unless indicated otherwise.